A SPANISH lawyer has apparently “vanished” leaving dozens of expatriates facing financial ruin. Jose Luis Maseda, 67, has left up to 26 of his clients facing an estimated five million euros in losses through transactions he arranged. Maseda, who speaks perfect English, allegedly handled the money, while advising his clients to invest in a string of suspect property deals. Some told the Olive Press that he had invested their money in a controversial golf development in Antequera, which is currently being investigated by the courts. One British estate agent is among at least 26 expatriates fearing the worst over dealings with Maseda, whose company Eurobrokers, in Benalmadena, has now closed. Police confirmed they are probing a series of allegations, which date back more than five years. Detective Juan Martin, who is heading the investigation in Benalmadena, revealed: “As the investigation goes on, more and more people are coming forward saying they have lost money, and Maseda´s name is mentioned. One client Kevin Bravant, 55, from London, claims he is owed 80,000 euros after investing the money in the controversial Valle Rosario del Golf development through Maseda more than three years ago. The former secretary at South Herts golf club, in north London, initially raised 110,000 euros by remortgaging his Fuengirola home through Maseda. He had planned to then invest 80,000 euros in a savings account to help finance his son’s dream of becoming a professional golfer. However, in August 2006, on the recommendation of Maseda, he decided to invest for a year at an agreed guaranteed seven per cent interest rate in three plots at the controversial development, which has been stopped in Villanueva del Rosario. The following year, Bravant – who this week filed an official police report against Maseda – personally handed the lawyer a letter with the required three-month notice period, to get his 80,000 euro stake back. But, two years later, despite constant demands, Bravant says he is waiting for his money, and it is now more than two months since he last heard from the lawyer. Bravant first made contact with Maseda after seeing an advert in a local paper in 2006 and was initially impressed by his “charismatic and charming” character. “My wife has had to go back to the UK because of ill health over this matter,” explained Bravant. “Maseda seemed like an honest bloke face to face. But he’s still got the deeds to the golf plot and his office which had all the documentation inside is closed, and I can’t do anything. Another expatriate, Della Brady, 37, from Tolox, handed Maseda 75,600 euros for the same golf development in which “not one brick was laid”. “He (Maseda) told me that his cousin was an architect and that my planned property was in safe hands,” explained the mother-of-two, from London. “I was receiving text messages from him until the end of August saying I will get money back. Colin Penfold, from Surrey, says Maseda recommended that he place a 50,000 euro deposit in a “secure bank” account. He is now unable to locate his money. Estate agent, Penfold, 71, says he is in contact with 26 people who claim to have invested in total up to five million euros through Maseda in would-be property deals. Penfold initially began dealing through Maseda in 2007 when he was negotiating to buy the Torrequebrada Hotel in Benalmadena. “I did everything by the book, I was very cautious and worked closely with my solicitors and bank in England for my own peace of mind,” he explained. The Olive Press was alerted to Maseda’s disappearance when dozens of comments were posted on our newspaper website. An investigation has since revealed that Maseda – whose wife’s name is Dolores – claims to have an MBA. He comes from Torremolinos and his business is posted on website Costa Property Services (www.costa-property-services.com) and is linked to various other companies including Bona Fide Legal, Country World and Muino and Foricher estate agent. Trading for more than 20 years, his business also claims to be an authorised agent for more than a dozen banks and financial houses, including Halifax, Sol Bank and Santander. 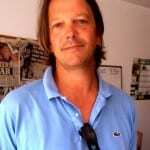 Fernando Foricher, who worked in Maseda’s office in Arroyo de la Miel for a number of years, told the Olive Press he “vanished into thin air” over a year ago. “He owes a lot of people money and me as well,” he said. “There were always people turning up at the office demanding money. “Last year I decided enough was enough and confronted him and he promised to sort it out. But then he and his wife disappeared. Boss of Costa Property Services Spain, Keith Ball, said: “I have been a shoulder for people to cry on who have lost money in schemes Maseda is connected to. Police officer Martin, who is based at Benalmadena local police, explained: “The case is very much open. Maseda in many instances obtained power of attorney and signed away money in the name of clients. Some people interviewed by the Olive Press fear that Maseda may avoid prosecution if he has committed offences given the suspected influence he has over some highly placed officials. However, another former colleague, Michael Brabant, who was introduced to Maseda three years ago, is confident he will get something back in the end. “I am also owed money as a result of this and if I knew where he was I would be the first to wring his neck.” said the boss of Spanish Partners. Despite phone calls to two addresses alleged to be Maseda’s homes in Madrid and Malaga, and two mobile phones, the Olive Press was unable to contact him. He also did not respond to messages sent to his email, or answer his door in Malaga. When the Olive Press tried to contact his nephew Alexis Luz, a policeman at Fuengirola National Police station, a colleague said he was “off sick.” He was unable to say when he would be better. Whenever you hear the words “I need power of attorney”, run! Not all, Frank, but many, I agree – and they’re not all Spanish. In my many years of having a connecton with Spain, the only people who have ever ripped me off here have been English, Irish and Scottish. Enough said! As for you, Fred, I find myself agreeing with you once again, surprising as it may seem. One definitely needs to be very careful with POAs; sometimes, however, you just can’t avoid having to use them. For example, try getting an ex-wife to fly out to go to the notary to transfer assets into your name! I’ve had to use POAs on several other occasions too, but my lawyers were trustworthy, and nothing untoward has happened (yet! – maybe I’ll cancel them, just in case…). Yes, I agree that con artists can come from any nationality Frank, but Spain really is in a league of its own. When I purchased a house here many years ago my lawyer asked a financial adviser friend to talk to me, at which point he refused to stay and said “I have to leave the office as I cannot be party to what you are talking about”. Needless to say what I then heard was a lot of talk about black money and various other schemes that were not rooted in any legality, but the lawyer advised his friend to tell me nonetheless. I took the opposite advice in the end, not that it got me anywhere. That’s the thing about Spain, you can do the right thing but they still crap on you one way or another. The Spanish people will always find a way to pay less taxes, less fees and less money overall. Spain just comes down harder on expats – that’s a fact. If you ever need a POA, reconsider why you need a POA and find another way, unless you know that your lawyer will not shaft you and that in itself is the million dollar question. I have read all the correspondence on this site and I have some news which may be of interest to those of you who are serious about recovering your money from Maseda. My lawyer, known in the Malaga courts as “The Bulldog”, is in regular contact with him and is processing a number of cases through the courts. To this end, he has formed an Association of clients in order to pursue the action with the maximum strength. If you wish to join the Association please contact me a.s.a.p. If you also wish my lawyer to fight for you I will give you his details when you contact me. We have been trying to get money back from him for three and a half years and have been getting text’s from him every week up till around august september. Oh and one other thing i informed his local Notary a long time ago about what was going off and that he was stealing money from people all they offered to do was charge us 150€ to deliver a letter to him…….. The mortgage that Jose fraudelently took out under my name has now been sold to a UK debt collector! I’m surprised the bank is even able to sell a fraudulent case file! Have you son contact Juan Carlos Carrasco Garcia.His telephone number is 952 469 038 or 952 197 061. His e-mail address is [email protected] with any proof he has. Join the association which is fighting this case. And here we all are, for me 1 year 4 months on, and where have we got – nowhere. Jose has been in and out of Court, paying some money back – it seems to stay out of prison – and yet he’s still around for all to see. He’s not got any money in his name, he is a big time crook and as you have said, is protected. The banks are selling on their debt to debt collectors in the UK, even though the bank know they are debts by a fraudster and they know full-well that they should not be selling on any debt under these circumstances – does that make them as guilty as Jose?? Is anyone in the UK at all interested? I reported my information to Interpol a year ago, have heard nothing since. has there been any further progress on getting our money back from this crook? You said you were robbed on a power of attorney, but were you robbed by the man himself Jose Louis Garcia Maseda? No . theres more than one person operating this scam , its apparently gone on for years according to our new lawyer , who says the brits just simply dont understand what they are signing and the effects it can have on thier lives, and how hard it is to prove that your p.o.a was misused. there are certain countries that have a history of systemic corruption, deceit and dishonesty they are also known as club med including France and Italy so beware. Their welcoming of foreigners goes as far as your spending ability and behind your back they are xenophobic and anti foreigners particularly those who do not share the anachronistic rituals which the club med countries pretend to be “culture’. I live now in France and to lump the French in with the Italians and Spanish is just plain wrong – how many illegal houses have been built in France – none. All French housing has been built to a standard, which you can’t say for Spain and Italy and from next year, the standards have been raised up to par with Building Regs Part 2 as per the UK. Anti-Brit encounters – never had any but I have had conversations with French people complaining about the ‘moaning Brits’ who expect French villages to change to suit them. Just as I’ve encountered Brits in Spain moaning because there are’nt any M&S stores or about the garlic in the food and naturally they moan because the Spanish speak to them in Spanish – sounds like you are one of these. No one would argue about the Spanish professional class being 95% corrupt but the way that so many Brits have allowed themselves to be ripped off – where were their brains – left on the planes – it would be laughable were it not for the consequences. There are plenty of dishonest Brits here in France ripping off the Social Security and working on the black. The French will always show respect for foreigners speaking French no matter how badly. Yes I left Spain because of the endemic professional corruption – not because I did’nt get on with the decent ordinary Spanish people – sounds like your a Brit with an attitude problem – best to go home then but you will have to accept the corrupt/dishonest/murdering Met police,politicians lining their pockets at our expense – did’nt Dave-we are all in this together promise the Brits a referendum on Europe – how’s that for deceit – yes go home and be happy. Any update on this story and this horrible little man? Hello Mark, I am doing some research into this man. I Knew him before he went into business in 1970 when he tried to rip off my family. I would be interested in knowing what the outcome of the court case against Jose Luis Merceda. I knew him before he started his very first business in Torremolinos in 1970. He opened his Real Estate office next door to our bar at the same time as us. I know how he started up, where it all started and how he did business.